Breakfast is probably my favourite meal of the day, there are so many options and it can be as healthy or as decadent as you want. I’m a big fan of porridge in all forms, cooked with milk and served with honey, eaten raw with a splash of milk and a spoonful of dried fruit or mixed through a yoghurt. It’s also great whizzed up in a processor and mixed with milk and egg to make a pancake batter – Sunday mornings are made for long lazy breakfasts like that. On weekdays I’m generally rushing out the door with a coffee to go and a slice of toast wolfed down while I run to the car and get going to work. Not being a morning person I’ll take a few more minutes in bed over time eating a decent breakfast any day! I am trying to get away from the toast/bagel/cereal bar habit that I’ve formed however and so have been looking for a good way to get quick, easy yet healthy and delicious breakfast that I can grab and go in the morning. 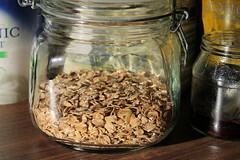 Shop bought granola or muesli tastes great but is often very sugar heavy and full of dried fruits that I end up picking out (raisins, I hate them!). I started out by mixing raw oats with my yoghurt and then thought it might taste nice to toast them first. Being a fan of those little fruit/yoghurt/granola pots I wanted to see if a homemade one could taste as good. I also can’t afford to buy those for breakfast every day! So here is my attempt to replicate those little pots in a healthier way. This is great to get ready the night before and grab on the way out the door. Use whole oats for this, not the quick/microwavable kind. Spread a layer of the oats on a baking tray and place into a hot oven (180C fan) for about 12 minutes. They will brown/burn within minutes so keep a close eye on them! Toast enough to keep in an airtight container, you can then put your breakfast together faster than making a slice of toast. They’ll keep for weeks in one of these containers. To assemble add some berries or stewed fruit into your pot, layer over some yoghurt, a couple of tablespoons of toasted oats, a teaspoon of milled linseeds and a drizzle of honey. Yum! 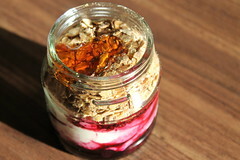 This entry was posted in Food and tagged breakfast, oats, yoghurt. Bookmark the permalink.